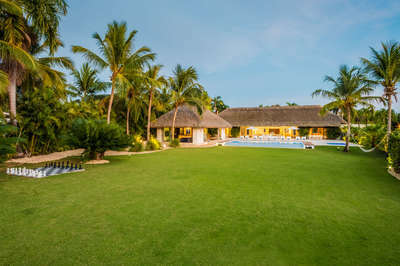 Welcome to Villa Batey 16, a fantastic six-bedroom villa in Casa de Campo with unforgettable views of the Caribbean Sea and the Chavon River. 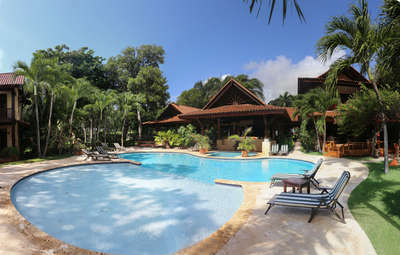 The villa is located on Pete Dye's Dye Fore Golf Course, right in front of where the Chavon River meets the Caribbean Sea. This spectacular view is yours throughout your stay in Casa de Campo, one of the most exclusive resorts and residential areas in the Caribbean. Come spend your vacation at the playground for the rich and famous and celebrities like Beyonce and Jay-Z, Pitbull, Marc Anthony, Vin Diesel and the Kardashians. Villa Batey 16 will offer you the perfect home base for a relaxing and joyful vacation at Casa de Campo resort where you will find everything you need for the best and most memorable vacation, including beach, golf courses, tennis courts, equestrian center, marina, shopping areas, restaurants, bars, nightclub, and more. To get around inside the resort, the villa rental includes two six passenger golf/touring carts which you may use to go anywhere inside Casa de Campo. The villa is all in one level, which makes it very family- and multi-generational friendly and you will feel completely at ease in this modern villa with Caribbean and tropical style/decor. Each of the villa's six bedrooms has a private in-suite bathroom, closet, air-conditioning and TV. Five of the bedrooms are located inside the villa. All bedrooms come with a TV (47" TV in the master bedroom) as well as direct access to an outdoor area and small garden where you can spend a quiet moment in peace before the day begins or as the day ends. There are three bedrooms with one king bed in each, two bedrooms with two queen beds in each and one bedroom with two full-size beds. The villa has two master bedrooms (with a king bed in each), which each has a huge bathroom and a private outdoor spa area with a Jacuzzi, perfect for an in-villa spa treatment or just a relaxing soak in the Jacuzzi. The most private bedroom has two queen beds and is located downstairs underneath the outdoor Palapa. The villa features large and comfortable living spaces, which include a living room area with three large sofas, an indoor dining room and a TV room which also doubles as a library/study and small office space. The outdoor area is nothing less than amazing! This is really where you will spend most of your time and in and around the swimming pool and enjoying the ocean view. The swimming pool is a salt water pool and can be heated. You can lounge around the pool in one of the comfortable sunbeds or enjoy the shade of the outdoor Palapa, which has a sofa area and also dining table. This is a great place to take your meals day and night. You also have a huge garden/lawn area to play around in. Whether you want to play a game of soccer, throw a football, play catch or do some yoga, the lawn area will work perfectly for any outdoor activity. Just bring your own equipment! A resort registration fee is required during your stay in order to access all Casa de Campo amenities and services. The charge is US $20 per night from 15 years old and older and US $10 per night for youths between the ages of 10 to 14 years old. This will be charged directly by Casa de Campo Resort. Children below ten years old do not require resort registration. Each person registered will receive an ID card, which will detail the dates of their stay. This ID card will grant the individual named on the card access to the resort, as well as the various facilities including access to equestrian centre, access to shooting centre, access to tennis courts, access to Cygalle Healing Spa, access to golf courses and advance tee times reservations at applicable rates. Use of fitness center at villa owner's preferential rates, Use of towels and chaise lounges at the pool in the main hotel area and Minitas Beach, use of courtesy internal hotel guests transportation, access to discounts, special offers and promotions for private rental guests in hotel restaurants, sport facilities and activities and access to the services of Central Romana Medical Centre. At the end of your stay all the charges to the ID card will be charged to your credit card. • Private airport transfers from Santo Domingo, La Romana and/or Punta Cana • Rental cars and other transportation. • Spa treatments or In-villa spa services. • Golf tee time reservations w/ transportation. • Grocery shopping (cost price of groceries plus 15% service charge). • All-inclusive meal plan for food and beverages consumed in the villa. • House bar (cost price of bottles plus 15% service charge).